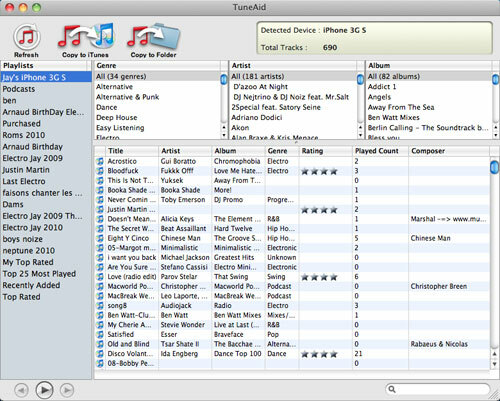 TuneAid for Mac is an iPod content recovery tool. It will let you import your iPod's library back into a Folder or iTunes with no effort. Apple's iTunes lets you transfer your music to iPhone, iPod or iPad. But this sync function only works one way: from computer to device. TuneAid for Mac lets you transfer your music to computer, and in doing so also directly copy to iTunes all your library : ratings, playlists etc. whether its a PC or a Mac! Let you import your iPod's library back into a Folder or iTunes with no effort. * Many fields supported, such as Play Count, Skip Count, Rating, Last Skipped, Date Added etc. * Auto detection feature, just plugin it in! Qweas is providing links to TuneAid for Mac 3.73 as a courtesy, and makes no representations regarding TuneAid for Mac or any other applications or any information related thereto. Any questions, complaints or claims regarding this application TuneAid for Mac 3.73 must be directed to the appropriate software vendor. You may click the publisher link of TuneAid for Mac on the top of this page to get more details about the vendor.